In the deep south of Italy, away from the major cities and famous resorts, you’ll find a region where time has seemingly stood still. Untouched by mass tourism, Puglia is a place where you can still see, feel, and taste the real Italy. The Italy where the centuries-old olive trees have survived invasions and changes of rule, where the cuisine is ingrained in the culture, and where the daily rhythm has largely resisted the pressures of modern life. 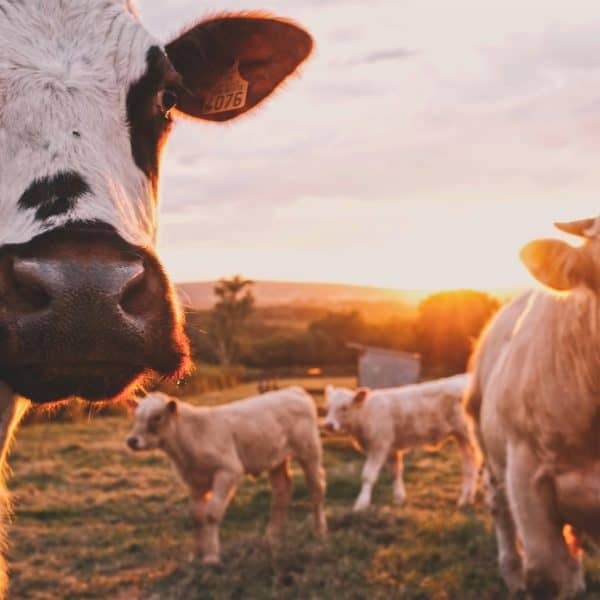 The Puglian landscape is a diverse mixture of earthy agriculture, whitewashed towns, deep ravines, cliff-top cities and some of the most beautiful beaches you’ve ever laid eyes on. If you’re visiting Puglia for the first time, you may be wondering how best to spend your time in this bucolic corner of Italy. I’ve put together this guide to help you plan your journey and to detail 6 of the best towns in Puglia Italy to help you with your planning process. Puglia, or Apulia as it’s also known, is at the bottom of Italy. If you picture the boot shape that forms this European country, Puglia is the high heel. The other two regions that make up the shoe of the boot are Basilicata in the middle and Calabria at the toe. Italy is connected to mainland Europe and borders Slovenia, Austria, Switzerland, and France (and, if you want to get technical, San Marino). Driving to Italy, and onto Puglia, is possible if you have the time and want to see more of the country on your visit. Alternatively, international visitors may find it easier to fly into one of the main centres such as Rome or Naples and drive from there. From Rome, the border of Puglia is just over 3 hours drive. And from Naples, it’s around half that. But the easiest option is to simply fly directly to Puglia. Puglia is home to two main airports, Bari Airport in Central Puglia, and Brindisi Airport a couple of hours South. RyanAir, EasyJet, British Airways, and Wizz Air all offer direct flights from the UK to Bari, the region’s main airport. Ryanair also offers direct flights to Brindisi, which is a great place to start your journey if you’re travelling further south. To fully enjoy your stay in Puglia, and to make the most of the region’s attractions, I’d recommend staying outside of the main centres. This way you don’t have to fight the traffic from locals on their daily commute, and you get to sample the beautiful countryside. Undoubtedly, this is where the true heart of Puglia shines. 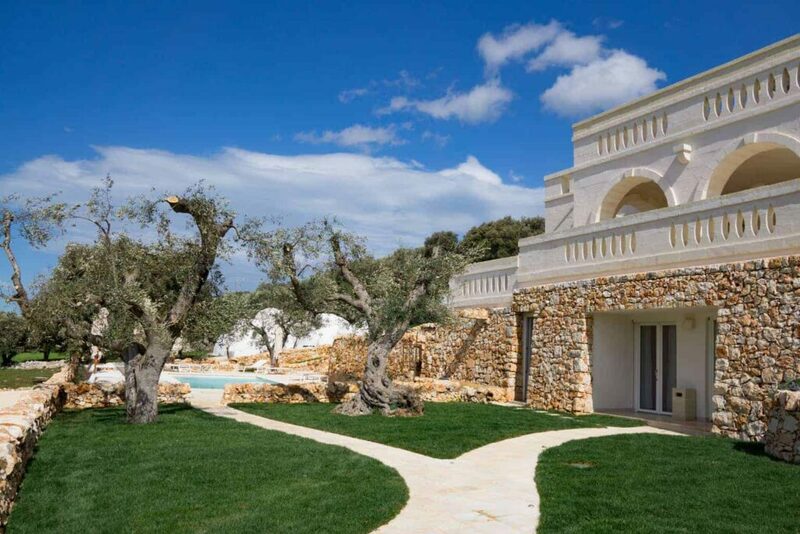 For my recent stay in Puglia, I was based just outside of Ostuni in a luxury villa*. Surrounded by olive trees, and with plenty of space to enjoy the tranquil atmosphere, it was the ideal introduction to the area and Puglian life. 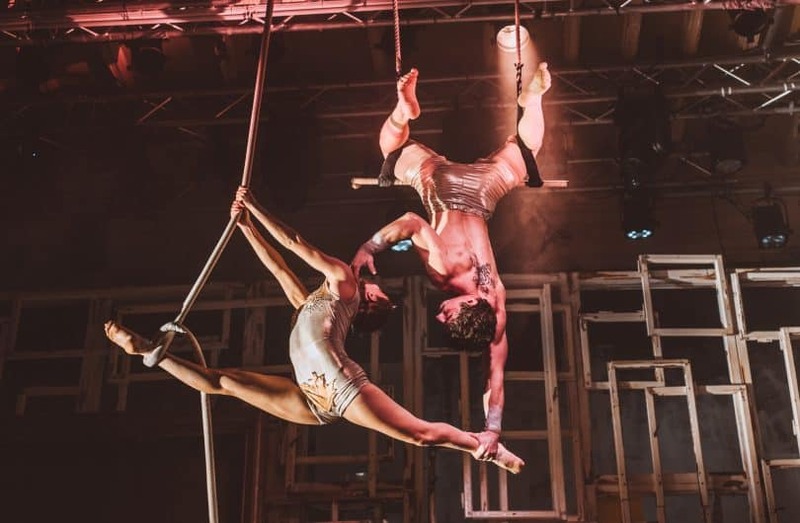 Bookings for You, run from the UK by Jo Mackay – Italian holiday expert – and Raro Villas who are based locally in Ostuni, both offer a range of properties throughout Puglia to fit most holiday styles and budgets. It is entirely possible to get around and visit many towns in Puglia with the help of public transport, especially if you base yourself in one of the main towns or cities. Train timetables can be found here and bus timetables here. However, my recommendation would be to hire a car and explore on your own time. Driving in Puglia is fairly straightforward as long as you keep your wits about you and don’t mind the Italians who drive much faster than wary tourists! When visiting Puglia’s old towns, be aware of no-drive zones and one-way streets. You may find it easier to park just outside the old town and walk in. And a word of advice – hire the smallest car you can get away with! You’ll save yourself a few headaches when it comes to parking or driving down narrow country lanes. For further travel inspiration in Italy click here. 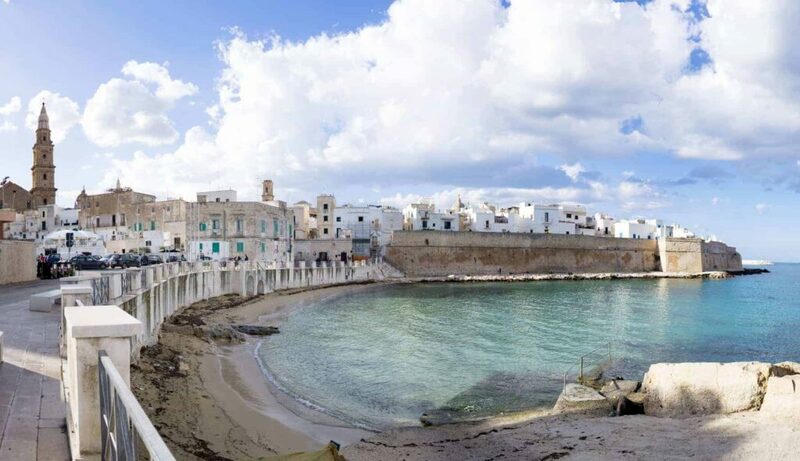 This list of the best towns in Puglia is concentrated on the centre of the region. Keeping in mind most visitors will start their journey in Bari, each of these Puglian towns can be reached within an hour or two of the region’s capital. Making them perfect day trips from Bari, Italy. 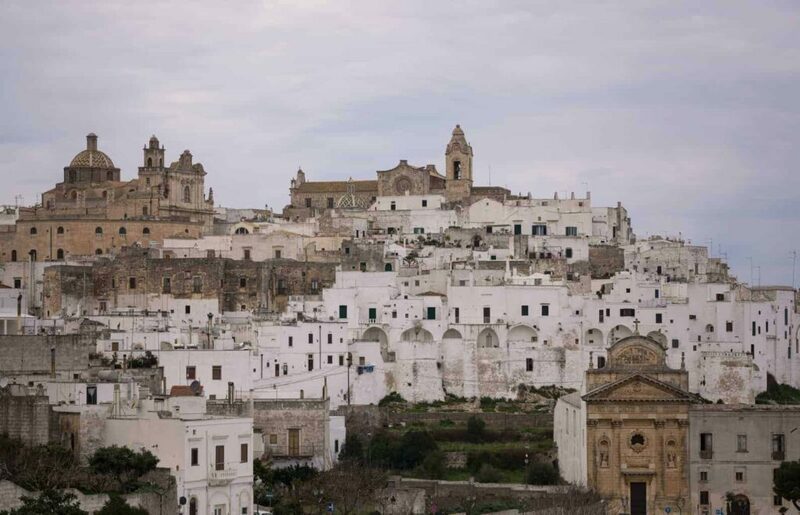 La Città Bianca, ‘the white city’ as it’s widely known – Ostuni shines from its vantage point overlooking the Adriatic Coast. Located 8km inland, all that separates Ostuni from the coast is a sea of ancient olive groves. Ostuni is a large town, with an active industry centred around the production of olive oil and wine. But it’s the old town centre that makes Ostuni stand out as a place you need to visit when in Puglia. 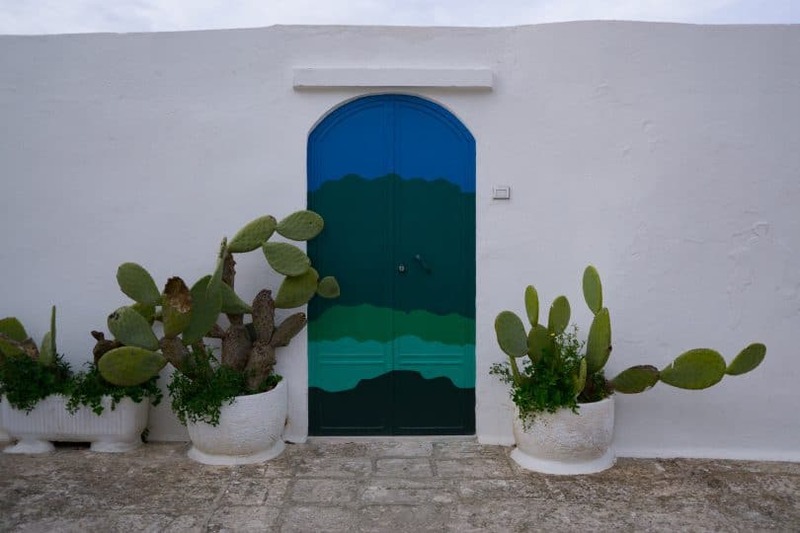 Painted in white and with a maze of streets that will have you happily lost for hours, Ostuni more closely resembles the villages of the Greek Islands than its neighbouring Italian towns. Unsurprisingly, Ostuni does have ties to Greece – it was rebuilt by the Greeks after being destroyed in the Punic Wars (the name Ostuni is derived from the Greek Astu néon, meaning ‘new town’). 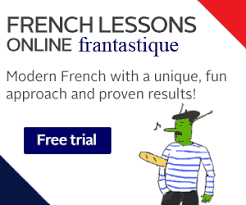 Wander the old town, and see if you can find the same street twice! Step inside the Ostuni Cathedral – the outside doesn’t do it justice. Sample the locally made olive oil and wines. Visit the farmer’s markets on a Saturday morning. 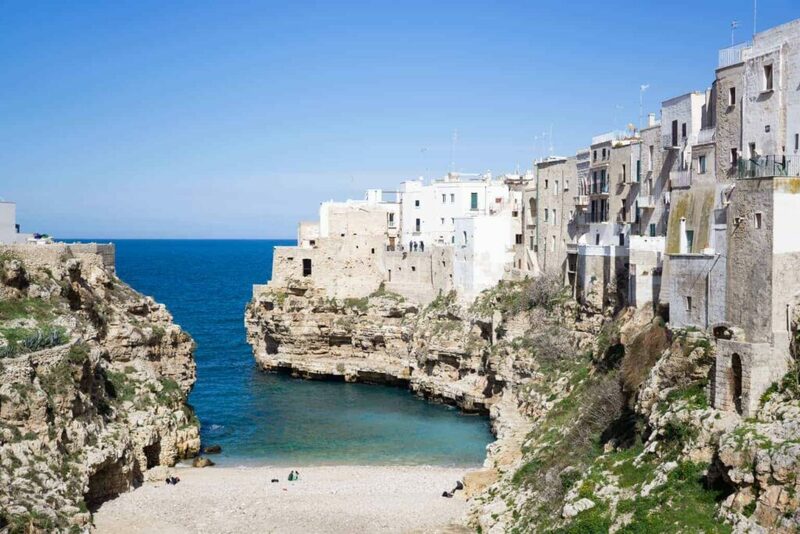 A quick 40-minute drive south from Bari, you’ll find one of the oldest towns in Puglia, Polignano a Mare. Its name, translated as Polignano at sea, is befitting this village that hangs precariously close to the edge of the sea cliffs it’s built on. The medieval old town is a joy to explore. As you wind your way through the whitewashed buildings and sun-soaked squares, you’ll eventually come across one of the lanes that lead to nowhere but an outstanding view. 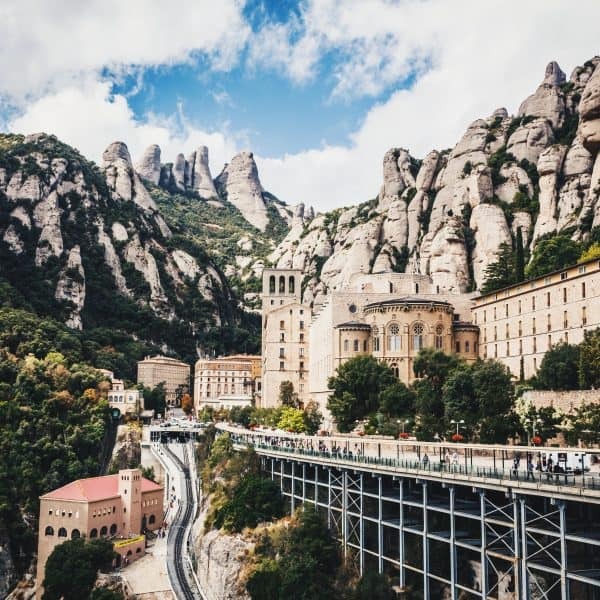 Hang on to the rails as you teeter on the edge of the concave cliffs and admire views of the coastline, beaches, and the endless Adriatic Sea stretching out before you. It’s unmistakably one of the best beach towns in Puglia. Witness the annual cliff diving competition. Take a boat tour to explore the sea caves beneath Polignano a Mare. Spread out on one of the most beautiful beaches in the region. Visit the Abbey of San Vito. The town of wheat and wine, Gravina di Puglia knows how to work its way into your heart (or at the very least your belly)! It may well have been a popular haunt throughout the ages for its crops, but these days there are many more reasons to visit this western Apulian town. Balancing on one side of a deep ravine, Gravina in Puglia offers visitors the chance to see into its soul. The ravine is pockmarked on both sides with caves and crevices worming their way through the earth. These caves hold remnants of times past and were used as shelters and churches from the 10th Century. Some of the caves opposite the town can still be freely explored without paying for a tour. Explore the network of caves. Take a tour of the San Michele delle Grotte. Walk the ancient Ponte Viadotto. Pop inside the Gravina Cathedral to see the splendour of the rose window. Think of trullo houses and no doubt Alberobello will be at the forefront of your mind. With the highest concentration of trulli in Italy, Alberobello has been made famous for these traditional Apulian conical shaped buildings. Dating back to the 15th century, trulli were what log cabins or camping cottages are today – a way to avoid paying property taxes. Their stone structures were originally constructed dry, without the use of mortar, so they could easily be disassembled. 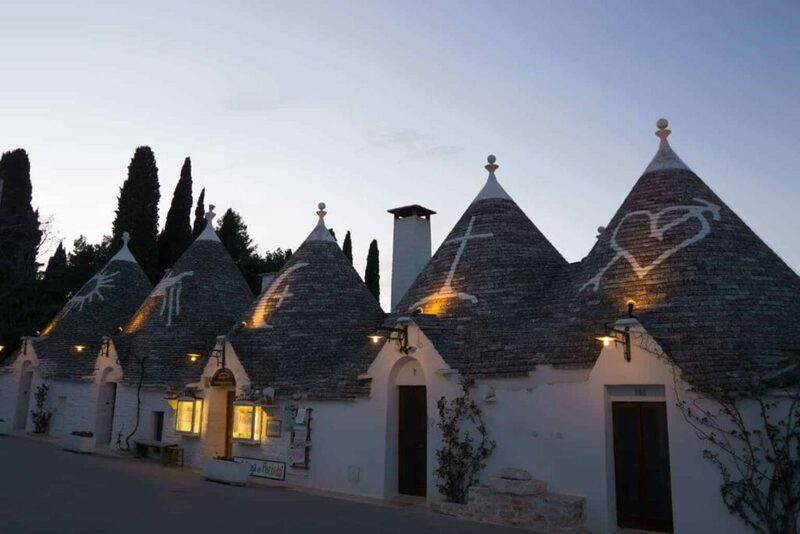 Today the trulli village of Alberobello has become a popular tourist attraction, with many of the trullo converted into stores selling souvenirs. While it may have lost a little of its original charm, it’s still one of those ‘must-see’ places in Puglia, and wandering into the newer area of Alberobello across the road offers another perspective of this iconic town. Eat lunch in a trulli. Visit the unique trullo church. Wander up the stairs to the ‘newer’ part of town (there are still trulli scattered in the streets here) for an amazing view of the trulli village. Almost next door to Polignano a Mare, a little further south of Bari, is the old port town of Monopoli. Fishing is an important economic activity in Monopoli and the revamped port is a bustling hive of activity. The old town, with its seawall, photogenic streets and 16th Century castle, is a must-visit on your Puglia itinerary. 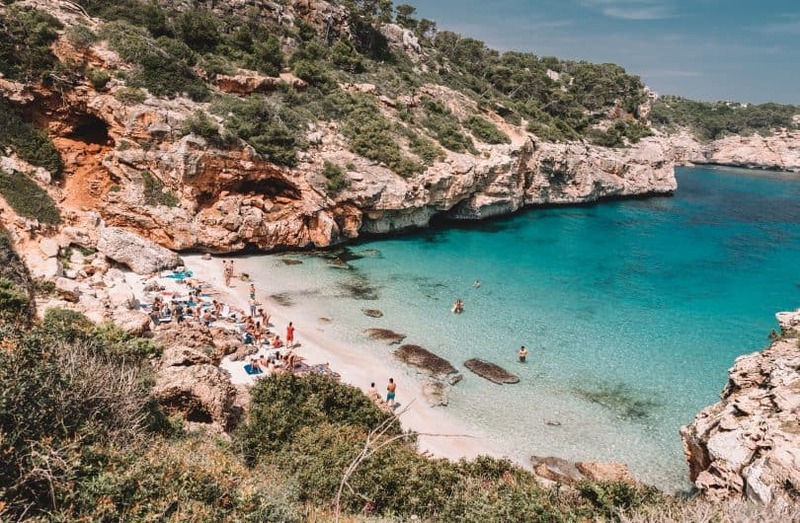 Sun yourself on Cala Porta Vecchia before strolling into town and feasting on the delicious local cuisine. 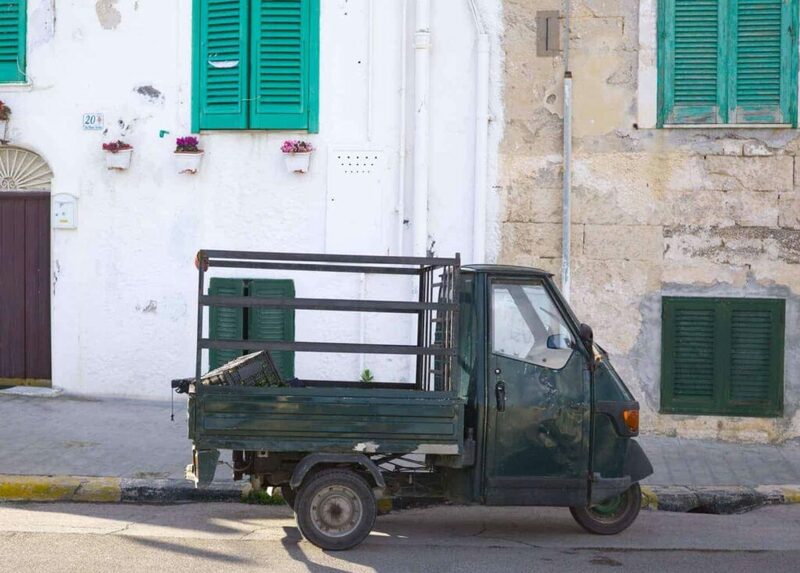 Unlike seaside towns in some other parts of the world, the daily hum of everyday life is still present in Monopoli as the old men chat on park benches and school children play football in the streets. 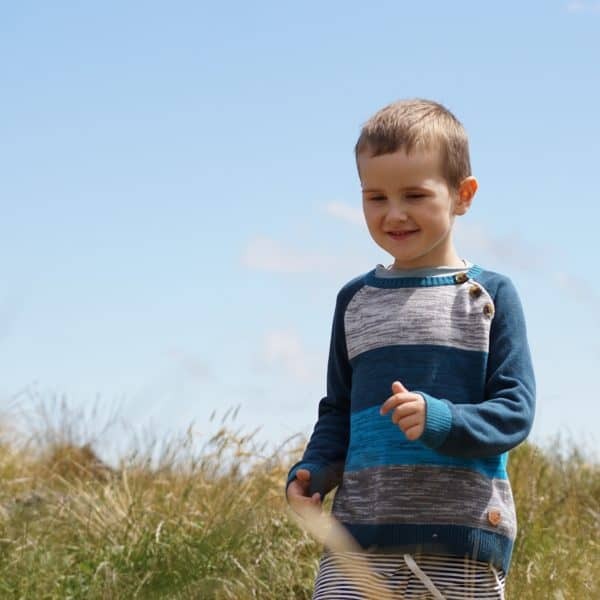 Walk the trail around the sea walls – it extends from the town beach through to the port. Take a dip in the clear blue sea. Visit the Roman Catholic Monopoli Cathedral. Venture into the town’s castle which now houses the Archaeological Museum of Monopoli. 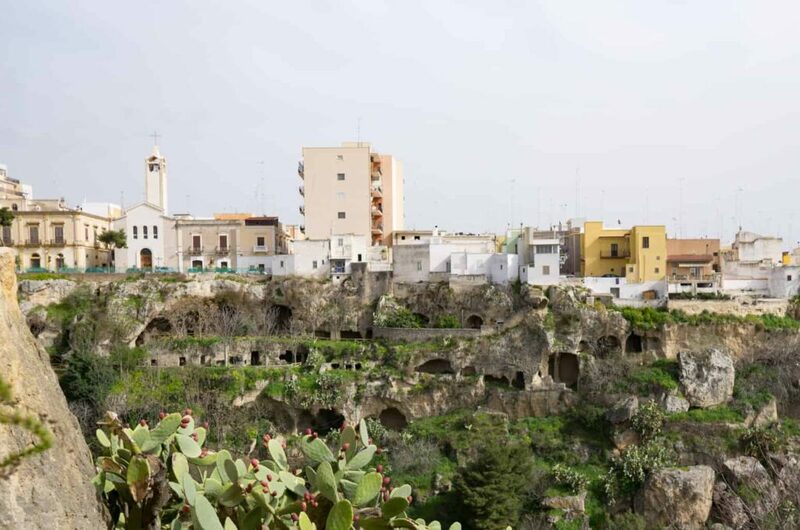 Slightly grittier than Gravina in Puglia, but just as intriguing, is the town of Massafra. Massafra straddles two deep gorges and is dominated by a medieval castle. These steep ravines were once home to dwellings and churches that date back as far as the Neolithic era. The caves now serve as a little-known tourist attraction, (their status is not protected in any way) offering you the chance to discover another part of Puglia. The town itself is unusual in that the streets are neatly plotted out in a grid, there are fewer curvaceous streets in this town in Puglia. 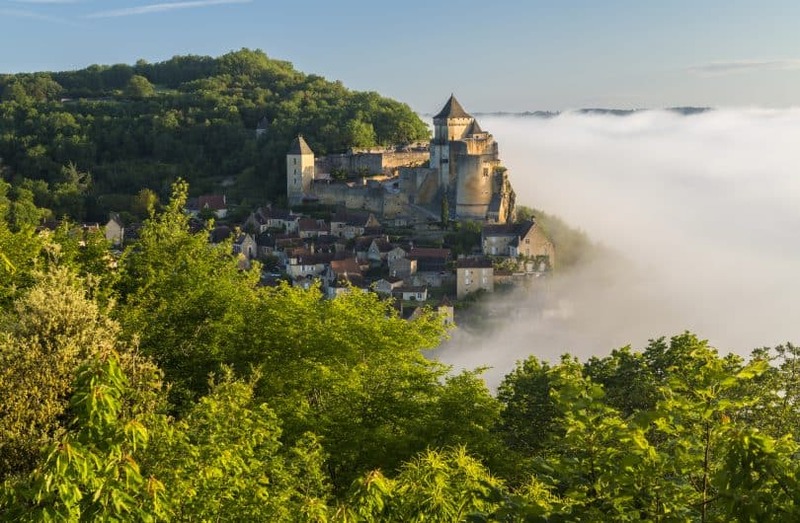 Two impressive bridges span the gorges and invite you to explore both halves of this colourful town. Take a tour of the cave village at Farmacia del Mago Greguro. Visit the Castle of Massafra. Dive into the local culture and discover typical Apulian living at its best. Puglia is home to some of the most beautiful scenery in Italy. It’s a place full of character, history, and intrigue. I hope this guide to the best towns in Puglia has inspired you to travel beyond Bari and discover what the rest of the region has to offer. In a few months I’ll be travelling back to Italy to discover the southern reaches of Puglia, so check back soon for an update on the best towns in Southern Puglia! *I was a guest of Bookings for You and Raro Villas during my time in Puglia. As always all opinions expressed are 100% my own. Yes, Puglia is magical, and I would encourage you to come further south to the Salento Region to the charming Broque town of Nardò. The charming Piazza Salandra will steal your heart! Close to the Ionian Sea – great food, wine and people!